You earned it. Make the most of it. If you have one or more retirement accounts at different institutions, consider consolidating your assets with a 401k rollover to a Macroclimate® Fossil Free IRA and make managing your retirement easier and more convenient – with peace of mind. It only takes 15 minutes to get started. Will you be OK in Retirement? You can access this TD Ameritrade 401k Rollover Calculator to help with your IRA strategy. It’s a financial calculator that helps you understand your rollover choices. After creating your FREE personal retirement plan in the Lab, then design your own Fossil Free IRA tailored to your personal goals, investment time horizon and risk tolerance. Have you changed jobs or are you planning to retire? 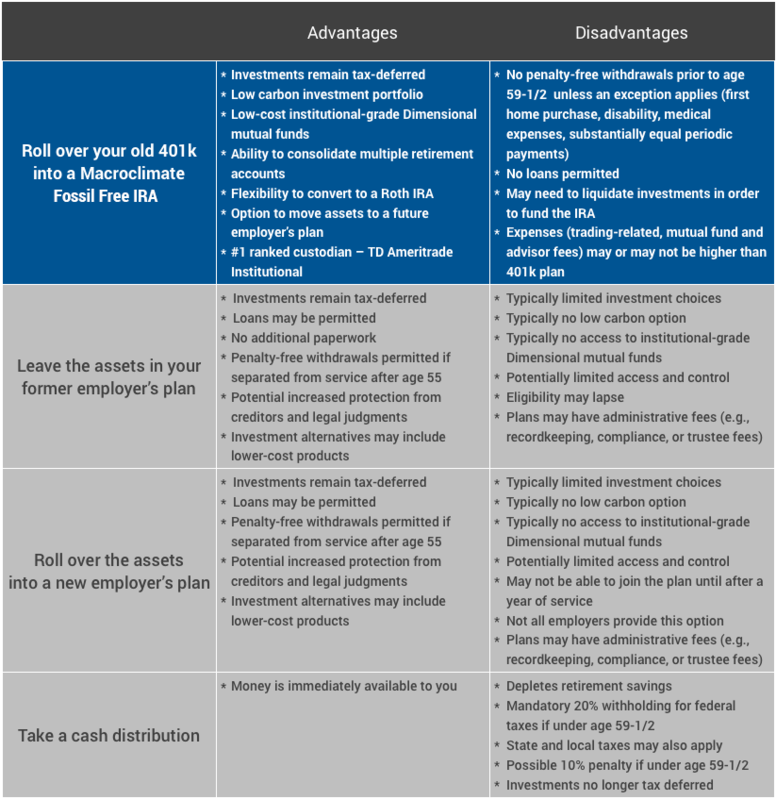 Use the chart below to help you decide if consolidating your assets into a Macroclimate® Fossil Free IRA is best for you or call 415-723-9695 to speak with us about your specific needs. You also may want to discuss these choices with your tax advisor. Simply design your Fossil Free portfolio and open an account by clicking below. We’ll then help you complete the necessarily paperwork*. * If you need step-by-step help with an IRA or 401k rollover, we can help you with the rollover process from start to finish, including assisting you in gathering documents from your 401k plan administrator. Have questions? Call 415-723-9695 Extension 2.